A cold, rainy day in January isn’t my usual idea of a good time to fish. But when I heard saugers were biting below a nearby dam recently, I grabbed an ultralight rod and some jigs and headed to the river. Drizzle fell from a lead-gray sky. A frigid wind rushed up the river corridor, threatening to blow off my stocking cap. Heading down to the waterside, I saw a dozen stubborn anglers fishing from the walkways. Polar bears, I thought. You have to be a polar bear to want to fish in this weather. “Are they biting?” I asked one angler. As I made my way down the walkway, a teenager in heavy coveralls let out a holler and started reeling in a nice fish. His fiberglass rod bent sharply as he battled his unseen opponent in the stiff tailrace current. The big sauger had no intention of being hauled ashore, and it was three minutes before the young man landed it. It was a dandy fish, close to 3 pounds, and it was hooked on a pink twistertail jig. The boy held the fish high for his friends to see, then fastened it on a chain stringer that held four smaller saugers. I dug through my tackle box, found a pink jig and tied it on. Then, reaching my hand into my minnow bucket, I corralled a 2-inch shiner and ran the jig hook through its lips. The man was fishing a black spinnerbait, a good lure at times but apparently not this day. I cast the jig/minnow combo upstream. I felt it bumping bottom on the retrieve. On my third cast, one bump was followed by a pickup. It wasn’t a jarring strike, just a slight “tap, tap” followed by the distinctive upstream movement of my line. After a short battle, I landed a 1-pound sauger. As I unhooked my fish, the fellow next to me let out a loud “Hot dog!” and began fighting his first fish of the day, another sauger as we soon found out. The action wasn’t fast, but over the next two hours, my newfound friend and I landed seven more saugers. That’s the way it is with saugers. These unusual panfish, cousins of the walleye, don’t have many fans. They’re don’t put up much of a fight, and the best fishing is on wintry days when even a penguin would welcome an electric blanket. But when it comes to table quality, there’s not a fish swimming that can top them. 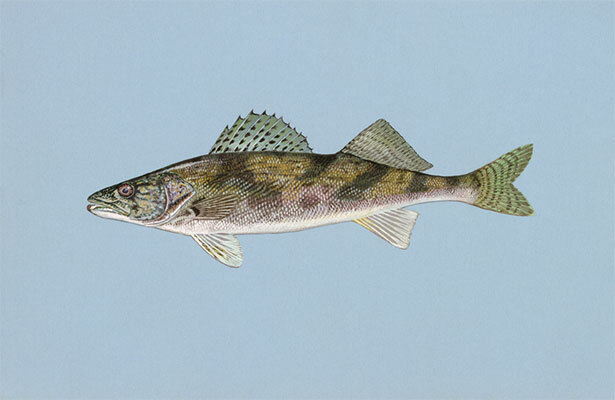 The sauger goes by many nicknames — jackfish, jack salmon, sand pike, pickering, horsefish and spotfin pike, to name a few. Given the sauger’s cold, reptilian looks, though, “rattlesnake pike” is probably its most descriptive colloquial name. This scaly gamefish sports a glassy stare, a flat snake-like head, a long skinny body and a gaping maw spiked with dozens of needle-sharp teeth. Take away its fins, stretch it out a bit, and, presto, you have a reasonable facsimile of a deadly serpent. Maybe that’s why saugers rank so low on gamefish popularity polls. Looking like a venomous snake won’t win you many friends. And when rated against more popular sportfish, the sauger would seem to be something of a wallflower. Bass, crappie and trout are the blonde, blue-eyed, shapely darlings of the fishing scene who always have a full dance card. Saugers only make it to the dance floor when the beauties aren’t available. That’s too bad, because these wallflowers have a lot going for them. Catching saugers on light tackle is perch-jerking fun at its best. Nibble on the flaky white fillets fried golden-brown over a streamside campfire, and you’ll experience the true meaning of the word scrumptious. Saugers are common in many rivers and lakes from Canada to Arkansas, and these spunky little darlings are most active during winter when many more popular gamefish are sulking in the depths and difficult to locate. Catching saugers can be amazingly simple or as difficult as building a nuclear reactor in your backyard. Success, or lack of it, depends largely on knowing where to fish and understanding the sauger’s feeding and movement patterns. The best fishing is usually below big-river dams where the fish are halted and gather in enormous concentrations during their winter spawning runs. Focus your attention on areas with brisk current, a hard bottom of sand, gravel or rocks, and quick access to deep water. During pre- and post-spawn periods, saugers are usually close to the bottom in deep-water depressions so they don't have to fight the current. When spawning starts, they migrate to more shallow structures adjacent deep water. Cast around riprap, wing dikes, lock walls, tributary mouths, long rocky points and other such structures to find fish. In large lakes, work around sand bars, creek mouths and the sides of the main channel. Sonar fish-finders help find deep-running schools. Live baitfish and small baitfish-imitation lures are the best sauger catchers. Of course, that takes in an astounding variety of baits — live shad and shiners, jigs, spoons, spinners, crankbaits and other popular enticements such as Gay Blades and the Little George tailspinner. You’ll rarely go wrong using live minnows, leadhead jigs, or a combination of the two. For minnows, use a heavy sinker tied to the end of the line to drag the bait to the bottom where saugers usually stay. The minnow is lip-hooked on a small, single hook attached to a dropper line tied a few inches above the weight. Leadhead jigs must be heavy enough to fall on or near the bottom. For shallow water, lighter jigs — 1/16 to 1/8 ounce — work well; in deeper or more turbulent water, some anglers go as heavy as an ounce. Allow your lure or bait to bottom-bounce in the current. When bankfishing, upstream casts keep your rig in the water longer. Keep a tight line to feel striking fish, but be sure the bait remains on or near the bottom. Although saugers bite best when it’s cold and dreary, don't expect to fish prime sauger waters all by yourself. 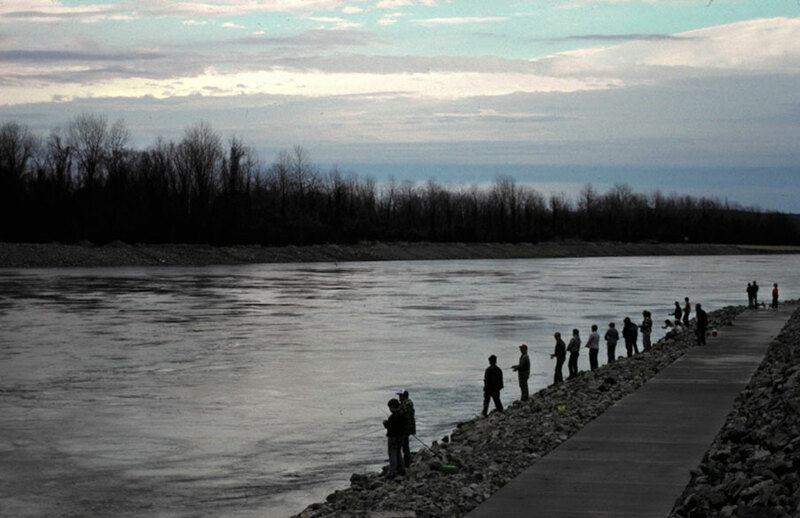 Sauger anglers may be few in number compared to other types of fishermen, but when you line them up shoulder to shoulder, they'll cover a pretty good stretch of river bank.